This 10 component comprehensive Reticulin Stain Kit is excellent stain for the identification of Reticulin fiber in tissue sections. Reticulin is a type III collagen which provides structural integrity. It is found in the basement membrane of many organs (i.e. liver, kidney, spleen). Kit is useful in the differential diagnosis of certain type of tumors such as carcinomas and sarcomas. Reticulin Stain Kit is a metal impregnation technique, in which ammoniacal silver initially binds to the tissue component of interest. The reducing agent will then produce a dark insoluble precipitate followed by a toning and fixing step. 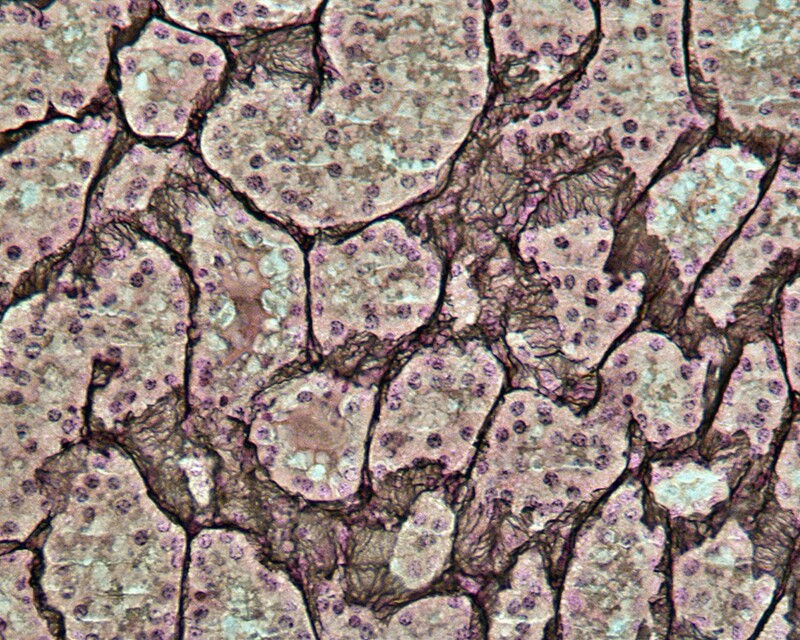 This stain enables visualization of changes in reticular pattern which are seen in some liver diseases and can also aid in the diagnosis of certain tumors. Pozdnyakova, O., Rodig, S., Bhandarkar, S., Wu, K., Thiele, J., & Hasserjian, R. (2015). The importance of central pathology review in international trials: a comparison of local versus central bone marrow reticulin grading. Leukemia, 29(1), 241–244.